p(blue). Editor's note: check out excerpt of Mike's book in the Dinner Guest Blog_ with Culinate. Across America, people are escaping fluorescent-lit grocery-store aisles to rediscover the fresh, seasonal offerings of the farmers’ market. A new and thriving culture has sprung up as thousands gather each weekend to pinch, poke, smell, and probe the produce — and at times each other. Who knew that buying peaches and eggplants could be such fun? Mike Madison, who raises organic flowers, melons, olives, and apricots, has been setting up at these markets for over 20 years. 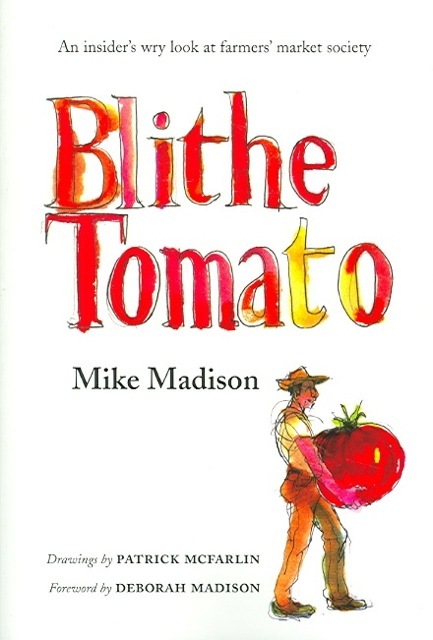 With keen observations and sly wit, Madison presents a series of essays and vignettes that introduce us to the characters who make our food, the economy that produces it, and the spirit that has placed farmers’ markets among the fastest-growing movements in the country.